If you’ve studied art much, you’ve seen that the old masters often painted things first in monochrome and then glazed color over their two toned paintings to create super realistic work. What you may not realize though is that glazing is a really easy technique to do yourself!! What is monochrome and why should I try it? Painting something in monochrome means that you’re painting it in two tones. Black and white, or raw umber and white are two of the most used variants of this method. By painting your work this way first, it allows you to focus on your detail and values without having to worry about mixing the perfect color at the same time. I find this method to be both faster, and easier to keep everything clean in my paintings. In the photo to the left, you can see where I’ve got everything fully detailed and shaded. I technically could have called this piece finished here if I wanted a black and white painting. You’re not skipping out on details at this point just because it’s monochrome. Once you’ve got a completed monochrome painting, its time for the fun part…adding color! Here, we want our colors to be quite transparent. Essentially we’re just tinting the color of the canvas now. When glazing in acrylics I will either use water to thin my paint into a translucent mix, or I will use a glazing medium by Liquitex. If glazing in oil paint I use my mixing medium, I prefer Liquin, which is a fast drying medium to thin my paint. 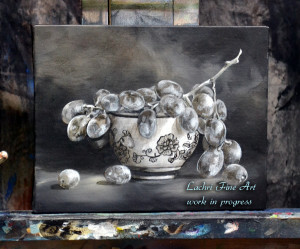 You will see in the video how easy it is to glaze color over your monochrome painting. The end result will be a painting full of depth! One massive tip for you oil painters, make sure that your monochrome layers of paint are 100% dry before you start glazing or your paint can lift off the canvas as you work!! If you are painting in thin layers and with liquin, they should be dry within 24 hours. Some paints like the Bob Ross line are not intended for glazing techniques and they will lift no matter how long you’ve let them dry. I personally use either Winsor & Newton oil paints (not the water mixable crap), or Grumbacher oil paints. Wait…I thought this was supposed to be a tutorial! Don’t worry, I’m not going to leave you with just the info I’ve written out. Here is a video that will give you more tips and demonstrate exactly how to do this technique! *note, all product linked are to my amazon affiliate links.